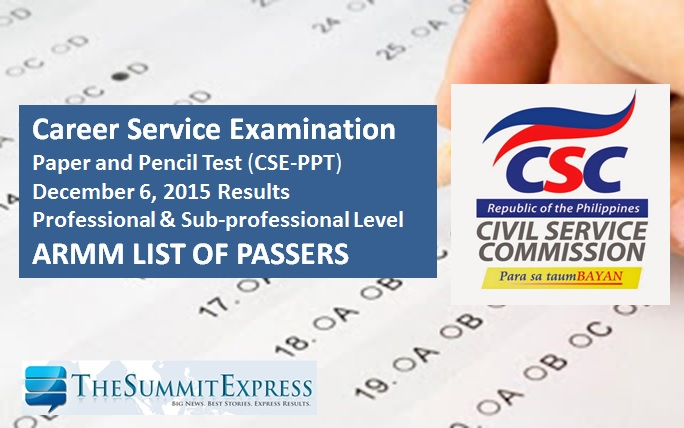 The official results of December 2015 Civil Service Exam - Paper and Pencil Test (CSE-PPT) are finally released online today, January 14, 2016. The Civil Service Commission(CSC) has released the full list of passers per region that were affected of Typhoon Lando in October last year. CSC said that a total of 56,985 registered examinees took the exam from areas where the examinations were suspended and re-scheduled to December 6, 2015. Examinees of the December 2015 career service exam in the Autonomous Region in Muslim Mindanao (ARMM) may now check results on this webpage.